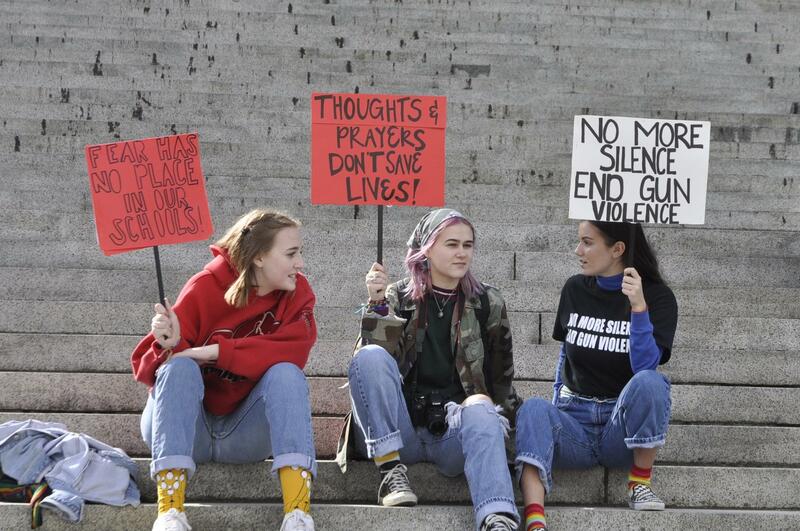 OLYMPIA – About 150 protesters – a mix of college, high school and junior high students who extended their individual school walkouts along with some adults – gathered Wednesday on the steps of the domed Legislative Building to demand more action on gun violence. A table was set up with voter registration forms and student speakers issued warnings to lawmakers, most of whom had returned home after the Legislature adjourned last Thursday. A bill to put restrictions on the sale of semi-automatic rifles and develop new programs for school safety died without a vote when time ran out. Lindsey Troutman, an Olympia High School senior who carried a sign with the date of this November’s general election and the message “Expect US,” told the crowd she was angry that school shootings keep happening and adults do nothing about it. Gracie Anderson, a Pacific Lutheran University student who organized the rally over the last two weeks, said she sent emails to all 147 legislators inviting them to attend. She heard from 10. Rep. Laurie Dolan, D-Olympia, one of three lawmakers who attended the rally, said the Legislature took little steps this year to address gun violence, banning bump stocks and allowing people guilty of domestic violence to lose their firearms. Published: March 14, 2018, 3:14 p.m. Updated: March 14, 2018, 10:44 p.m.